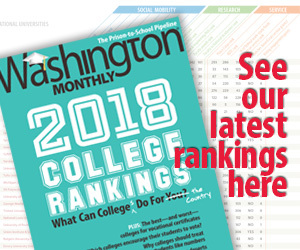 This is a guest post from sociologists Neal Caren and Sarah Gaby of UNC-Chapel Hill. The paper they are discussing is available here. While Occupy Wall Street has received most of its attention for its sustained public displays of numbers and commitment in New York City and many other locations, the movement also has an impressive online infrastructure. In addition to individual websites, multiple Twitter hashtags and dozens of Livestreams, more than 400 Facebook pages have been established in support of various US Occupy mobilizations. In order to begin to understand how activists and their supporters are using Facebook, we have been creating an archive of all the posts and comments shared on these pages since the movement began. In our working paper, we detail the data we have collected, including trends by location and major categories of posts; here we highlight some of the basic trends we have identified. The data here includes information collected up until October 17th. A total of 911,822 posts or comments had been contributed to occupy related Facebook pages. 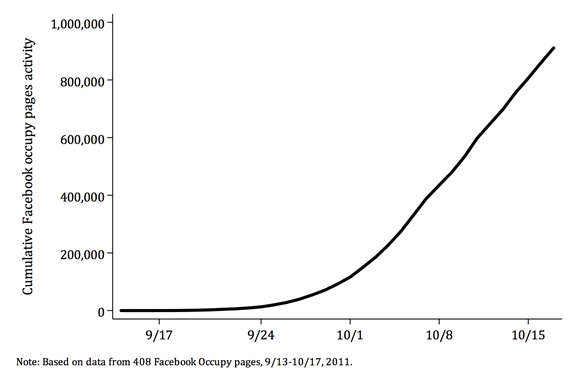 Daily Occupy activity on Facebook peaked on October 11th with 64,410 posts. On the day when 129 people associated with Occupy Boston were arrested, 20,912 people contributed to 64,410 posts or comments on 352 Occupy related pages. A total of 153,056 people have been active on Occupation related Facebook sites. This number counts only those who have contributed to a page, either by posting or through a comment, and does not count those who have only “liked” or “shared” a page or post. This includes 55,150 individuals active on Occupy Wall Street related pages; 23,641 on national pages; 5,989 on state or regional pages, and 99,664 on local pages. 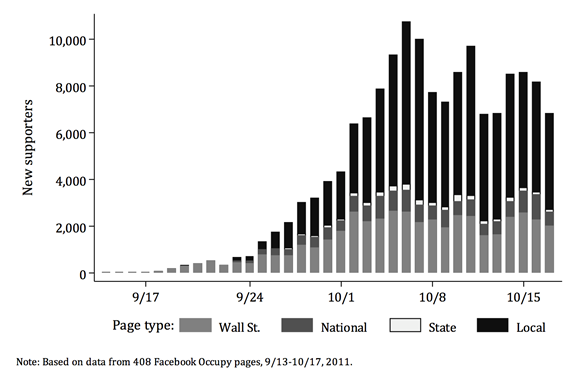 Before September 28th, a majority of new users posted on the Occupy Wall Street page. Since then, two-thirds have been first observed active on local pages. There isn’t much overlap between the Wall Street and the non-Wall street folk, as 90% of individuals who became interested enough in a local Occupation to comment on it first became involved in their local sites. Facebook pages may play less of a role as the movement develops its own online and offline structures, but it has been a mechanism for a large number of people to encounter and interact with other potential supporters in a familiar setting.